Time To Revisit Your New Year’s Resolutions? – What's for dinner, Doc? Time To Revisit Your New Year’s Resolutions? Hope is not a plan. Turn your wish into a plan. What really matters to you in 2015 and what’s your plan? Take a moment to reflect on the first six months of 2015 and look ahead to the rest of 2015. Do you need to change course? Re-commit? Congratulate yourself? Try this exercise. 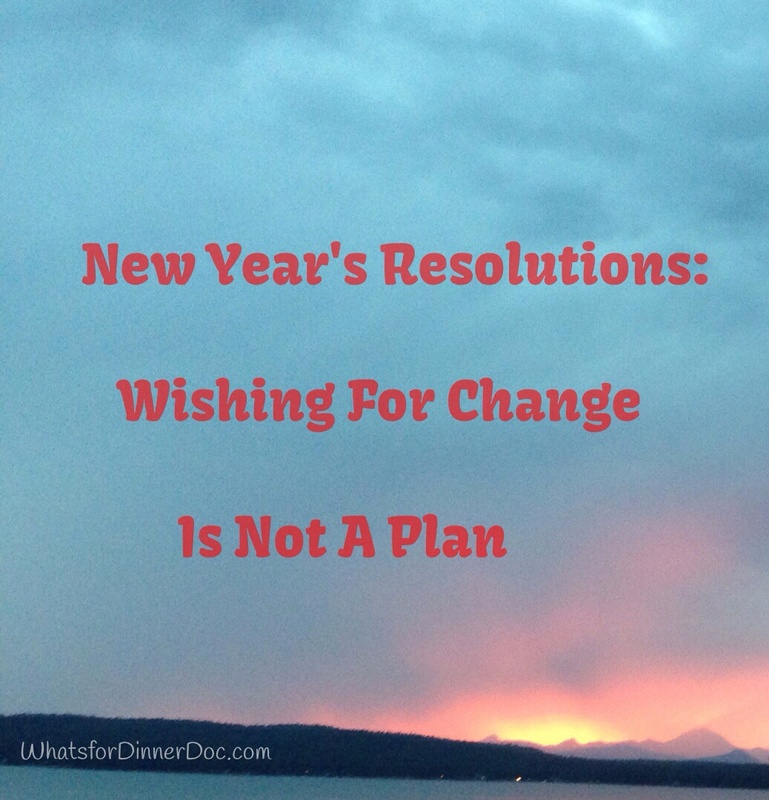 Start by writing down a resolution, which is really just a glorified wish. Now write down a concrete plan to make it happen. If the resolution appears to be too much to tackle in the moment i.e. you have no idea how to start, then reframe it. This exercise is about success not failure. If the resolution is too much for you now then write down a plan to get you closer to your goal. For example, “I will run a marathon in 2015” may not be realistic for you but “I will walk for 30 minutes every day for 6 weeks, then I will start a couch to 5K plan if these old knees will allow it”. Now you have turned a wish into a realistic plan. Here are my intentions for 2105. I will remain committed to healthy eating: I will continue to develop delicious and nutritious recipes and share them with you. I have been eating delicious healthy meals but alas I haven’t been sharing them enough with you. I will try to do better. I will schedule time to meditate every day. I confess that I meditate maybe once a week but I’m feeling peaceful so that must be good enough for now. I will continue to find grace in my daily work as a physician: I will keep an open heart. I am no longer working in clinical medicine because of my injuries but I am keeping an open heart and I will figure out a way to continue to serve my community as a physician. I might teach at the medical school or influence health policy through the written word. I will remain grateful even in the face of challenge: I will begin and end my day with gratitude. This has been a struggle with all of the changes this year; my injury, looking at hip surgery, forced retirement, and losing a little of my identity, but I do begin and end my day with gratitude for my family, my friends and the life I have created for myself. Being honest with yourself about your priorities and your faults is a good place to start if you truly want to change. I hope that you enjoyed my “Let’s Be Honest” series in 2014. Here are the links for any posts that you may have missed. Thank you for this reminder; a good point to check in with ourselves. So sorry about your tough year but change happens for a reason and hopefully your outcome will continue to be positive. You are always serving your profession even just by way of this Blog. Keep if up! Even forced change can be good (and scary). When the dust settles, I hope to focus more on my writing. I was sorry to read about Buddy. Yes, Go for it! Wishes are easily derailed where as plans take more effort to destroy. See the plan, be the plan. ha ha sounds like a coach’s speech. Let me know how your plans work out. it sounds to me like you’ve done better with New Year’s resolutions than most. I resolved a long time ago never to make NYR’s 😉 That’s part of being honest with myself. My next goals are to do an open water lake swim every day as soon as I can actually get to my summer house, develop more healthy, anti-inflammatory meals and write daily. It helps that I can pop over to your blog for a plethora of delicious veggie meals whenever I need inspiration. “Be Flexible” is my code phrase this year. We can only live in the moment. Right? Right.